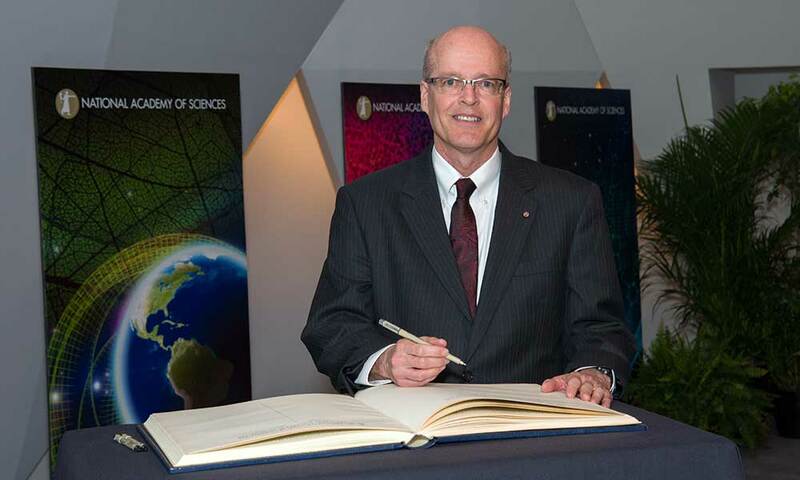 Richard Aslin at the National Academy of Sciences induction ceremony on April 26, 2014, signing the historic registry, a tradition started by Abraham Lincoln in 1863. Aslin joined 83 inductees at the ceremony in April to become an official member of the academy—one of the highest honors given to a scientist or engineer in the United States. Founded in 1863, the academy has counted among its members Albert Einstein, Robert Oppenheimer, Thomas Edison, and Alexander Graham Bell. Aslin is one of seven University of Rochester professors and professors emeriti elected to the academy in past years. Serving as principal investigator of the Rochester Baby Lab, Aslin explores how infants and toddlers develop cognitive abilities in both language and object recognition. He studies how the statistics of the environment, or the probability that something will or will not happen, impacts learning. Using methods such as eye-tracking and brain-imaging, he has shown that learning is a process of forming statistical models in the brain, models which then allow a person to interpret or predict a changing environment. Aslin received his doctorate in child psychology from the University of Minnesota in 1975 and arrived at Rochester in 1984. Author of more than 100 publications and editor or contributor to 36 books, Aslin is the recipient of grants from the National Institutes of Health, the National Science Foundation, the McDonnell Foundation, and the Packard Foundation. He is a fellow of the American Academy of Arts and Sciences and the American Association for the Advancement of Science, and he is former president of the International Society for Infant Studies. In 2012, Aslin was elected a fellow of the Cognitive Science Society. The National Academy of Sciences is a private nonprofit engaged in scientific and engineering research and is dedicated to the furthering of science and technology and their use for the general welfare. For more information, visit www.nationalacademies.org.